Marines Memorial Theatre (609 Sutter Street at Mason) in San Francisco. 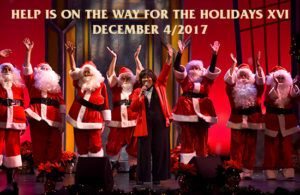 Help Is On The Way For The Holidays Gala, being held on Monday, December 4, 2017 at the Marines Memorial Theatre (609 Sutter Street at Mason) in San Francisco. Performance-only tickets start at $60. VIP/Underwriter tickets start at just $125 and include a post-show Cast Dessert Party next-door at the Clift Hotel. All but $40 of your ticket purchase is tax deductible. PLEASE MENTION ALRP when ordering tickets by phone or online.